Safety loop handle is designed for fingertip control with either the left or right hand. Three-position release controls raise, neutral, and lower operations. 230° steering arc. Other features include: full-adjustable push rods on 6" wide forks, poly-nylon steering wheels and load rollers, and grease fittings with hard chrome-plated rams and pistons. Two-year pump warranty. FACTORY QUICK SHIPFOB ILLINOIS. 2.9" low to 7-3/4" high fork height. 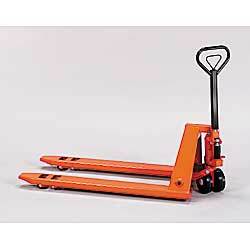 SPECIFY FORK SIZE: A - 20-1/2"W x 48"L, B - 27"W x 48"L.
2" to 5-3/4" fork height. Steel load rollers. 27"W x 48"L forks. XP-1508A Wt. 200 lbs. 20-1/2" x 48"
XP-1508B 27" x 48"	 27" x 48"	 Wt. 200 lbs.